Berkery Noyes Represents United Business Media in the Sale of The Consultant Print Group to HMP Communications - Berkery, Noyes & Co., LLC. 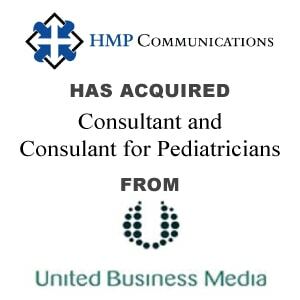 New York, April 18, 2011 — Berkery Noyes announced today that the firm represented United Business Media (“London-UBM-L”) in its sale of The Consultant Print Group (the “Group”) to HMP Communications, Inc. (“HMP”). HMP investors included Alta Communications and Susquehanna Private Equity Investments, LLC (SPEI). Terms of the transaction, were not disclosed. The Consultant Print Group is a print publication unit of UBM Medica, LLC and focused on the primary care market. The Group includes the print magazine and custom publishing operations of two titles, Consultant and Consultant for Pediatricians. Both titles are highly respected, independent journals for primary care physicians, physician assistants, and nurse practitioners, and are known for their editorial excellence, strong readership and respected brands. Berkery Noyes acted as United Business Media’s exclusive financial advisor in its negotiations with HMP Communications.